Dwarf orange trees grown in containers provide a decorative plant for a patio, along with fresh fruit. Place the trees in a location that receives at least eight hours of direct sunlight a day, preferably from a southern exposure. With proper care, a patio dwarf orange tree will produce flowers and fruit two or more times a year. 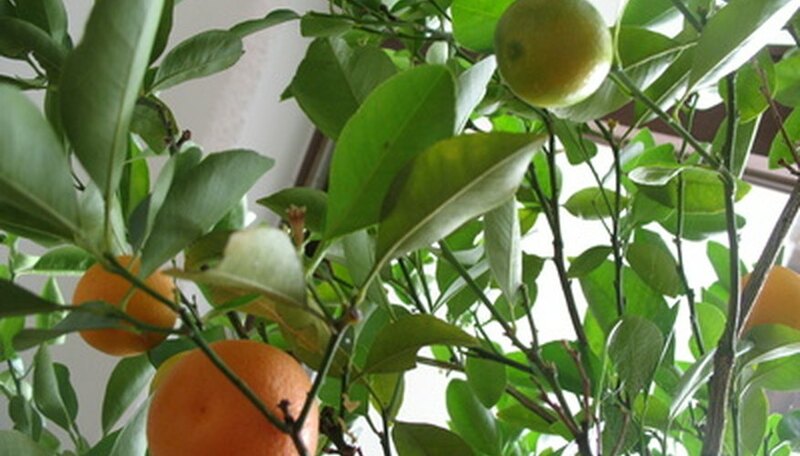 Winter the tree indoors in areas with winter temperatures below 50 degrees F.
Plant the dwarf orange tree in a container that is the same depth as the root ball and several inches wider in diameter. The tree prefers a container that is wide instead of deep due to its shallow root system. Monitor the pH of the soil by testing it with a home pH test kit. Citrus trees prefer an acidic soil. Yellow leaves on the tree are an indicator that the soil needs more acid. Mix 1/2 tsp. magnesium sulfate with 1 quart room temperature water to lower the soil pH. Amend the soil every two to three months, if necessary. Water the tree to keep the soil moist but not wet, as this will cause root rot. Monitor the soil moisture closely during the hot summer months, as the tree will require more frequent water applications. Water the tree generously until water runs out of the container drainage holes. Do not let the container sit in standing water. Fertilize dwarf orange trees with a complete fertilizer high in acid every month during the active growing season and every three months during the dormant months. Rhododendron or azalea fertilizers work well as they are acidic fertilizers. Re-pot the dwarf orange tree every three years when the tree becomes root bound. Increase the width of the container by several inches. Plant the tree in a soil mix that is even parts peat moss, sand and sterile potting soil. Prune the orange tree to remove dead and damaged branches. Remove all trunk stems on young trees except the three strongest. This will train the tree and stimulate branching growth instead of trunk growth.